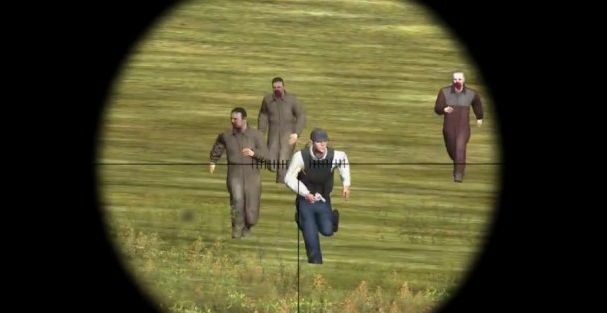 DayZ is a zombie Mod for, Arma2, and its expansion Arma2 Operation Arrowhead. For those of you unfamiliar with the land of PC gaming, mods are commonly occurring 'modifications' to existing PC titles. Created by the gaming population (typically the programming variety), Mods exist in a variety of shapes and sizes. Sometimes they boost graphical quality, they may change a perceived flaw, add something comical, or they might e a completely different title using the original game as a jump off point - DayZ is one of these. I enjoy Zombie Apocalypse games in all shapes and sizes. You start the game at a random spawn point, usually near the coast on a map 225kms square. You have a pistol with a few clips, some bandages, flares, and probably a bit of food and water, that's it, and you'll need to find more. The map holds towns, great expanses of woods, five hundred plus zombies, bandits, and your fellow players. Those players might be helpful, they also might be hard up for stuff and want yours. Chances are anyone you meet will want your stuff and will take it if they have to, so be suspicious. People and the undead aren't the only thing you have to be wary of, you need to eat, you need to drink, and if you're hurt, you need patching up. Canteen empty already? Better find a water source. The other night I spent the better part of an hour trying to find my way out of a forest. Some folks, the twitch muscle variety perhaps, might think that sounds like a boring experience. Not me. The servers run a full day cycle, and that includes nighttime, no pushing a button and waiting 'til daylight, I needed gear to survive, so I had to find my way out of the woods. I didn't know if there was a town over the next rise, or if a few roaming Zombies were in the next copse of trees. As I scouted the terrain for movement and any sign of a building or town that might contain the gear I needed to keep going. You aren't a hero in DayZ, you are a dead man walking; the average lifespan is around about a half hour. Ever find yourself wondering what would happen in real life if you ran out of bullets and had a bunch of zombies after you? I did. Turns out you get eaten. Having been the alpha predator in numerous apocalypse scenarios, it was with a novel feeling of hopelessness that I just had to accept my fate. That vulnerability is runs right through DayZ. Hanging by a thread, you'll need to go to town to find the goods, but you go a street to far, or a step too careless and, well... you only have so many bullets. As DayZ picks up steam, features will be added, bugs will be squashed, and people will flock to it like a horde of zombies alerted by a gunshot.